The problem with this Mustang's window mechanism was typical. It was very hard to crank the window up, but easy to crank it down. The owner of the car feared he would break the mechanism while cranking, leaving the window in a partially opened position. This, of course, would lead to intrusion of both the weather and unwanted humans. It had to be fixed. To gain access to the innards of the door we had to remove the trim panel, a task generally easier to accomplish than one might think. The panel was held in by spring clips, historically the most common method used by manufacturers during the 1950s, well into the 1970s. 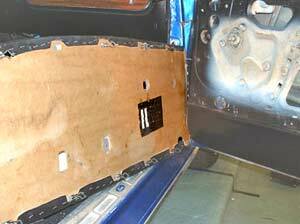 Before prying the panel loose, however, we had to remove the handles. Removing armrest & door lock handle. Window and door lock handles can be held in place by clips or screws. 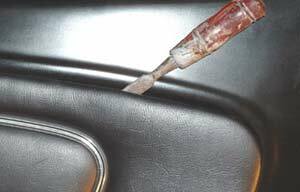 Those held by clips require careful prying between the handle and panel, then delicate release of the clip using a dental pick or special clip-removing tool. Fortunately, the Mustang's handles were held by screws, so a simple use of an allen wrench got them loose. 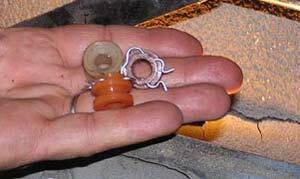 A gentle prying allowed the handles to slide off their splines. Prying the panel loose...keep the blade as close to the clip as possible to prevent breaking backing material. 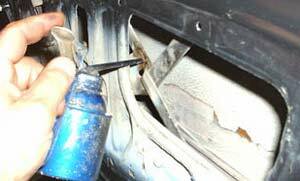 The armrest was held in place by two large sheet metal screws, located underneath. These came off easily, as did the armrest. Once that was done we carefully went around the outside edge of the panel with a thin bladed chisel and pried off each clip, keeping the chisel as close to the clip as possible to avoid breaking the panel's backing material. 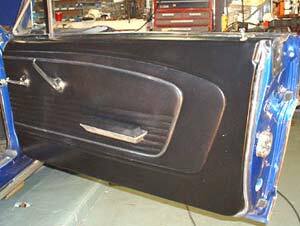 Once all the clips were popped loose the panel fell into our hands, revealing the inner parts of the door. Usually there is a sheet of plastic (used to prevent water damage to the rear of the panel) covering this area, but previous owners of the Mustang probably threw it away. Looking inside, the first thing we noticed was a total lack of lubrication at all the moving joints in the lift mechanism. There are three types of moving parts: the pin-pivot type and the slide-in-track type, plus the drive gear assembly. 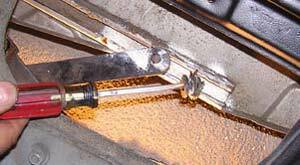 Pin-pivots are easy to lubricate with engine oil, but the slides needed to be removed to check wear. The drive gear appeared to be in good condition. Lubrication of pin-pivots are pretty straightforward. We found excessive wear on two of the three nylon slides and, fortunately, had a couple left over from a previous restoration. With those installed and all moving parts lubricated (oil for pivots, white grease for everything else) we tried the crank mechanism. Oddly enough, the crank worked perfectly for a few ups-and-downs but then started binding. It wasn't as difficult as before to crank the window, but definitely too stiff. Nylon slide inserts into channel, pin slips throught slide, and all is held in place with wire clip. This left us wondering if there were any pivots we hadn't seen or if something else was contributing to the problem. Breaking out a mirror, we held it and a light in such a way as to see the inside of the door panel clearly. No other pivots were evident and all points had lubrication. One thing did catch our eye, though. The rear window mount rides up and down in a 1-inch wide channel lined with nylon webbing. The webbing was quite worn, but of more concern was the mount itself. It was heavily rusted, causing it to drag on the nylon. We decided to use a film of white grease on the webbing to allow it to transfer to the rusted mount and help stop the drag. Once we cranked the window up and down several times it became smooth and easy to operate. We put the trim panel and handles back on and checked the window action again. It operated almost as good as new.